We scoured the internet in search of the ultimate weeknight meal, and we asked food bloggers from all over to submit their recipe that best fit the bill. After hundreds and hundreds of entries, we whittled it down to 10 finalists, then had you, the reader, vote for your favorite. It was close, but Sara from Budget Savvy Diva took the crown with her Slow Cooker Chicken Enchiladas, and boy was this dish good! We want to say congrats to all the finalists once again and thank all the bloggers for their delicious submissions. We look forward to doing the contest again this year! Slow Cooker Chicken Enchiladas: This recipe comes courtesy of Sara from Budget Savvy Diva who says, "This is the perfect dish if you want a meal that is extremely yummy, but you do not want to be stuck in the kitchen. You and your family will love it!" 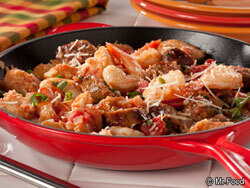 Sausage & Shrimp Panzanella Skillet: This recipe comes courtesy of Brooke from Cheeky Kitchen who says, "This dish loves ya, baby! It's not just supremely quick, and crazy delish (with giant hunks of rustic french bread to soak up the sausagey tomato sauce. Hello.) But it also feeds a full table of hungry peeps in minutes. Dig in, darlin'! 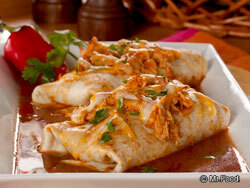 You need this meal in your mouth!" Tex Mex Meatballs: This recipe comes courtesy of Krista from Budget Gourmet Mom who says, "Not only do these delicious meatballs make it to your plate in under 30 minutes but they are sure to fit any budget! Better yet, make a double batch and freeze some for later." Fajita Burger: This recipe comes courtesy of Carrian from Sweet Basil who says, "This is the ultimate week night meal because it takes hardly any prep work, (you can even chop the veggies, and make the patties a day ahead) and you can grill outside or in a pan. 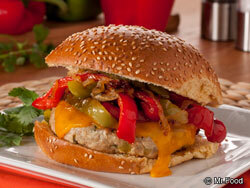 Who doesn't love a juicy burger all year round?!" Bacon Buffalo Mac and Cheese: This recipe comes courtesy of Ally from Ally's Sweet & Savory Eats who says, "In an ideal world, we'd all like to eat a restaurant quality meal every night, but in actuality we don't. 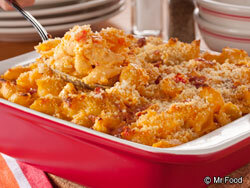 This simple, easy and unique mac and cheese brings the best of those together - quality and simplicity." 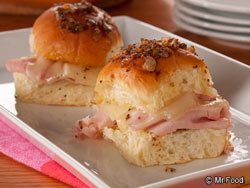 Baked Ham & Swiss Sliders: This recipe comes courtesy of Crystal from Mrs. Happy Homemaker who says, "A quick trip to the deli counter gets you the handful of ingredients you need to make these fantastic little sammies. 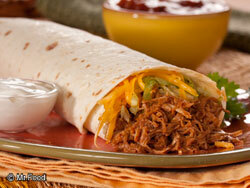 They're simple, fast, delicious - and will leave your whole family begging for seconds!" 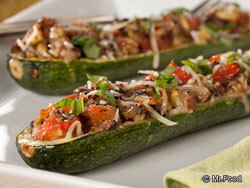 Spicy Italian Stuffed Zucchini Boats: This recipe comes courtesy of Georgia from The Comfort of Cooking who says, "These spicy Italian zucchini boats are simple, quick and versatile enough to give them your own scrumptious spin! 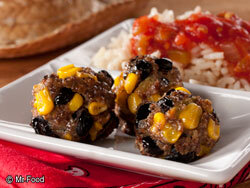 Make them meatless or add Italian sausage for a fast, flavorful weeknight meal!" Wafflewich: This recipe comes courtesy of Kristl from The Budget Diet who says, "It's a breakfast, it's a dinner...it's a Wafflewich (Waffle Sandwich), and kids love 'em! 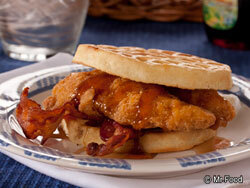 Serve my Chicken Waffle Sandwich with a fruit salad for a frugalicious and fun dinner tonight!" 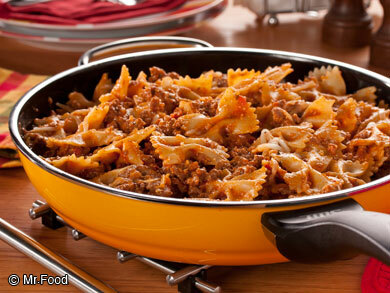 Easy Skillet Lasagna: This recipe comes courtesy of Stephanie from Plain Chicken who says, "This skillet lasagna scores a perfect 10; it is simple, filling and absolutely delicious! You probably already have all the ingredients in your pantry to have this Italian feast on the table in less than 30 minutes." Easy Slow Cooker Pork Carnitas: This recipe comes courtesy of Tiffany from Eat at Home who says, "Five minutes of prep, and the slow cooker does all the work. Taco night never tasted so good!"